The wife and I were in Orchard Road running some errands on a Saturday late morning and decided to do lunch in the area. 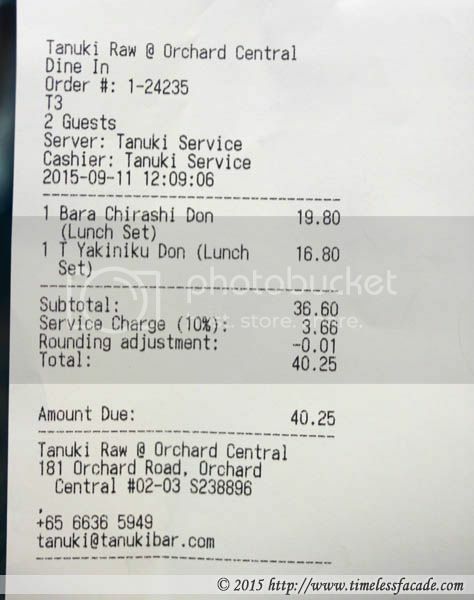 A quick search online for Donburi led us to the relatively new Japanese bar & restaurant, Tanuki Raw, started by the same guy who started the relatively successful Standing Sushi Bar, Howard Lo. 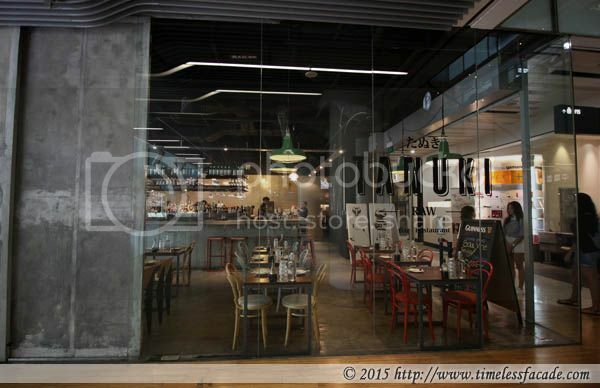 Located on the 2nd floor of Orchard Central, Tanuki offers rather closely packed tables amidst an industrial setting. 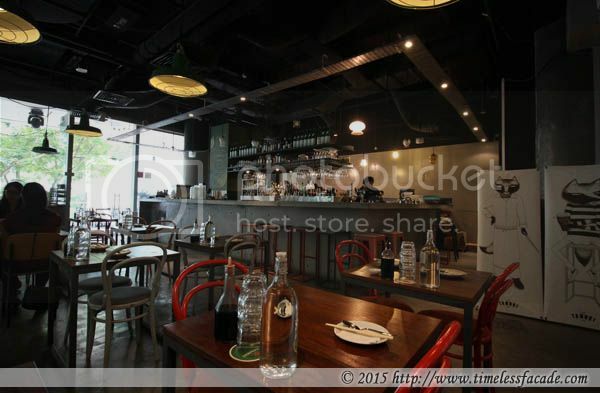 Think cement screed floor, exposed ceiling and halogen lights; not my kind of style. Thankfully there wasn't a crowd when we dropped by. Cubes of reasonably fresh scallop, sea bream, tuna, swordfish, salmon, striped jack salmon roe and tamago served on rice with Tanuki's signature sauce; lacking in bite as the cubes were cut too small while the signature sauce came across as mildly salty with a hint of ginger. Overall a decent bowl of chirashi don but in comparison to that of Hana Hana's, a more expensive (~ $3 more) but less tasty version. 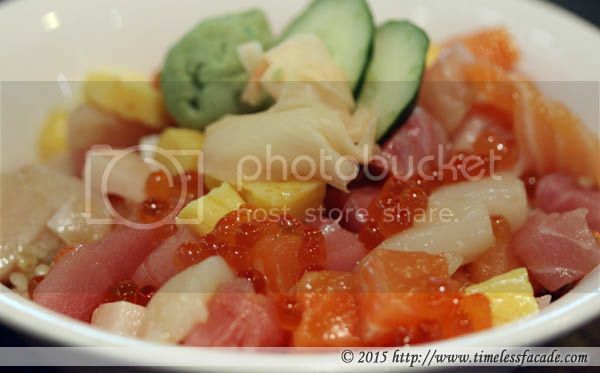 In short, if you want value for money chirashi dons, stick with Hana Hana. Apparently Tanuki's pièce de résistance and the highly raved about dish (on social media at least), the truffle yakiniku don looked promising at the onset. Black angus short rib slices pan seared till medium that came across as tender with a slight hint of beefiness and topped with a creamy onsen egg. However the truffle soya sauce was way too salty for my liking (had to drink lots of water!) and I only tasted weak, random flashes of truffle oil (no fragrance to speak of). The presence of a rather distinct taste of ginger didn't quite do it for me as well (not a fan of ginger to be honest). 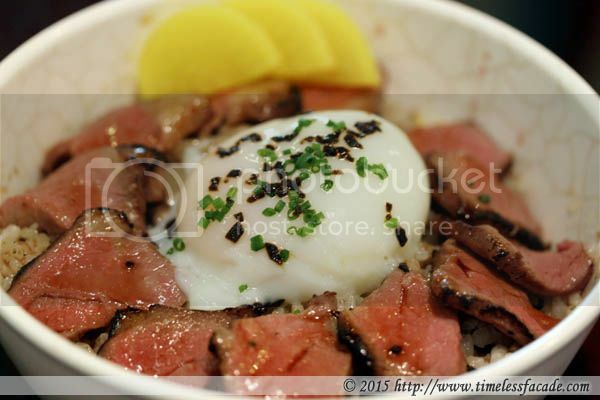 All in all, still a decent but rather small serving of yakiniku don. There is an option to top up $2++ for a set lunch which includes a bowl of salad, miso soup and hot tea. The both of us went with this and chalked up a total bill of ~ $40; not too expensive but less than satisfied (ironic that Lady M a few shops down provided that satisfaction instead). Service was okay but I doubt I'll be returning anytime soon.